Thanks to the trigger job threads here on CZ Forums, and the help of good members (eerw, double pedro amongst the many) I now have a pretty darn good trigger. One of the things that could've helped me in the past were some better diagrams of the sear and what was going on where. So, after working on a couple pistols and making good triggers, I documented what I did and decided to throw my own contribution in to help others. What you're looking at is the sear on my CZ-40b which I believe is approaching, or has just passed 17 thousand rounds... So yes, it's a little beat. But, I was able to outline and put some 'Cliff Notes' on the three key areas I worked on, with a front view and back view. If you guys have any constructive suggestions, please let me know. updated 10-14-08: i updated the pictures to revise the information regarding the trigger bar leg. please delete older pictures if you have already downloaded them. thanks! When refacing a factory CZ sear for use with either (a) the cz competition hammer, (b) a hammer with short SA hooks, be aware that thousands of rounds later, the hammer will wear away at the sear. Please take note to periodically check for any rounding or wear to the bottom of the sear face to ensure continued reliable operation. i repaired my sear face by refacing it in the meanwhile. before long, i will most likely have mine case hardened to deal with the hardened, short SA hooks on my cz competition hammer. as always, any time you modify a sear, always go through the pre-flight safety checklist before running live ammunition through your pistol. a pre-flight safety checklist can be found by clicking here. Excellent photos and explanations Gerard. 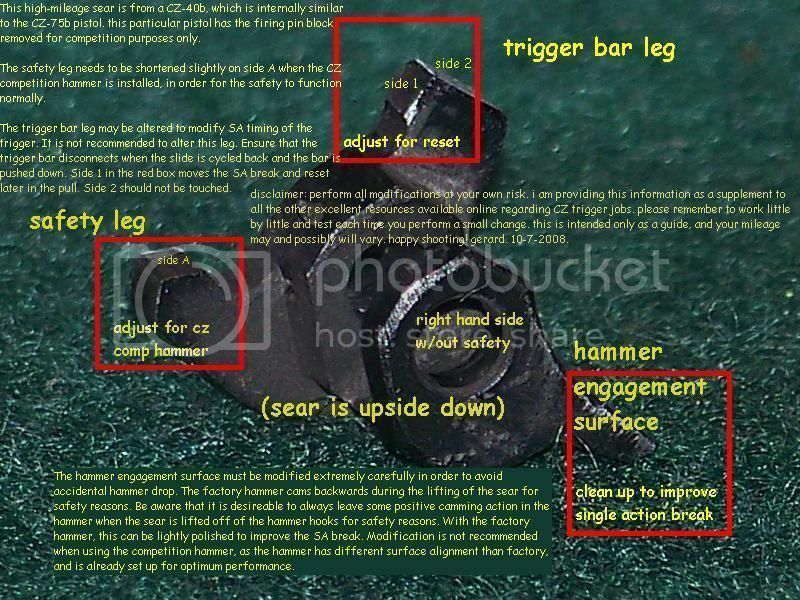 definitely good information in helping one understand the insides of a CZ..
Now that is some great photographic work. I love the text boxes and the information given there. The information is clear and consice. One question. Can you show us the tools and fixtures that you used to perform these modifications. I worked on a "junk" 1911 compitition hammer recently. Basicly I was able to make the hammer hooks taller by removing metal off of the "flat" area in front of the hooks, but I was not able to square up the hook faces with the stones that I had. The hammer lasted a couple of hundred rounds before I discovered that the hammer would follow the slide when released from the "locked back" position. Cow Bob. aka Virginia Jake. One comment - Removing material from "Side 1" on the lower sear arm moves the SA break point and the reset point later in the trigger pull. This will only affect reset if you are using a trigger without an over-travel stop (or one that is not properly adjusted). If you are using a trigger with an over-travel stop (presumably adjusted so it stops just after the SA break) then removing material from "Side 1" will move the break point past the over-travel stop (i.e. the SA will not break unless you re-adjust your over-travel stop). Once you re-adjust the over-travel stop, the length of the trigger reset will be the same as before. DP..even though the length of the reset would be the same, but wouldn't the point of reset be sooner..as the trigger bar moves forward..wouldn't it pick up the sear at a closer point to the rear of the frame?? so DP, correct me if i'm wrong... what i'm getting is that if i trim material from "Side 1", then both the SA break and the reset move backwards? i guess if you put it that way, what i'm trying to do is to move the SA break and the reset closer together for faster shooting... let me know how i need to adjust those pictures... thanks! Yes, it would pick up the reset closer to the rear of the frame, and the SA would break closer to the rear of the frame by the same amount. so DP, correct me if i'm wrong... what i'm getting is that if i trim material from "Side 1", then both the SA break and the reset move backwards? That is correct - both the break point and the reset point move backwards. I agree, that is the idea. With the FPSL removed, the reset will be limited by how far the trigger bar has to move for the sear to release the hammer. So it's mainly a matter of how much sear hammer engagement there is. There is one fine point - you can change the angle of "side 1" so there is less (or more, if desired) backlash in the engagement of the trigger bar and the sear leg following reset. You can feel what I am talking about if you let the trigger out enough to just reset and then slowly pull the trigger. You will (proabably) feel some free travel (0.020" - 0.040") before the trigger bar engages the sear. This free travel represents reset that is not associated with hammer/sear engagement. If you get rid of it (by changing the angle on "side 1") the reset will be shorter for the same amount of hammer/sear engagement. I like this on general principles, but once the trigger is reset any pull will start to move the sear. This may lead to problems (doubling, bump firing) if the engagement is too little (especially if close to neutral) and the reset too short. Because of this, it may not always be desireable to remove the free travel between the reset point and the point where the sear is engaged by the trigger bar - it depends in part on the type of SA break you have - on one end of the spectrum will be short, creep-free but heavier/stacked at the break point (like you get with a stock sear and competition hammer); at the other is a SA break that is smoother, slightly lighter, with a bit more creep (like you might have with a secondary angle on the sear). I **think** you can get away with a shorter reset with a heavy/stacked type of break. All MHO. The easy fix would to remove any reference about modifying "side 1" to shorten the reset. It would be worth mentioning that modifying "side 1" will change the SA timing which may be helpful for some problems people run into or setting up the trigger break points to the likings of a particular shooter. i'm back guys. i updated the pictures as suggested! I did some polishing on my sear and changed the angle a bit to bring close to neutral so as not to compromise safety. This reduced the heavy SA pull. But I wanted more, specially the DA pull since I compared it with a stock Taurus (Berretta type) of a friend and that was better so I brought it to a gunsmith last week who sells CZs here. After a day got it back, he cut the hammer spring two coils and instead of the sear, he did the work on the hammer and reduced it's contact surface. I was surprised, didn't expect him to touch the hammer, he said the SP01 and 1911's has an even smaller surface contact and will work thousands of rounds because the metal is good. Hmm, come to think of it, the hammer is easier to buy here and I did get better groups in the range that week. My trigger is now 4# in SA and 6# in DA. yup. 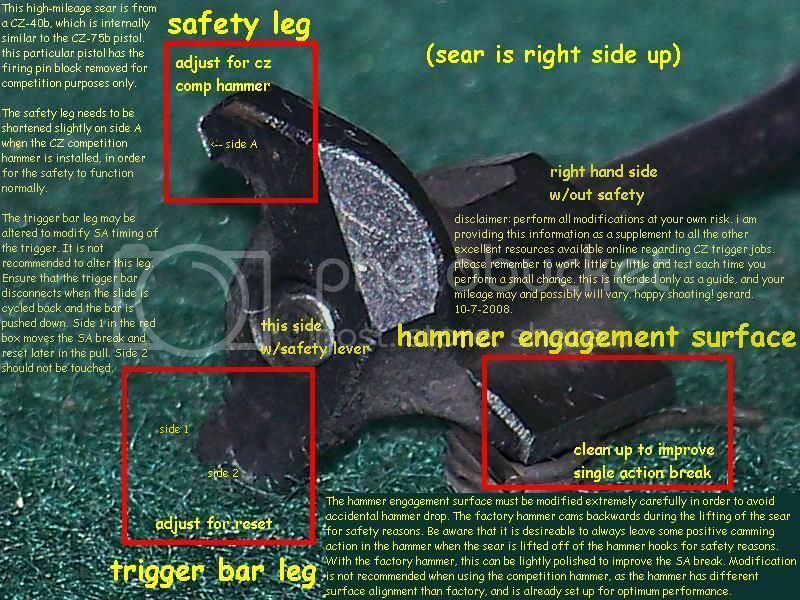 when they modify the hammer, they are essentially reprofiling it like the hooks on the competition hammer. the good thing about the competition hammer is they can reduce the mainspring further because it's repositioned pivot points make up for a weaker mainspring. squirrels ........ that's a great cheat-sheet photo and pre-flight list .......... are you sure you're not a surgeon ? Pics restored thanx to jameslovesjammie !